Tomorrow (Tuesday 4/26) from 2-4:30p in Carter Auditorium our Ecology lab students will be presenting on their semester research projects at Wild Basin. The theme of this research is, “The effects of urbanization on ecosystem services at Wild Basin.” All are welcome to attend! St. Edward’s University has issued a press release about our recent Steelcase Active Learning Center grant award. Furniture installation in JBWN Room 206 will commence this summer. Get ready for a new, interactive learning space to come online for the 2016 – 2017 academic year. Angie Lux ’12, a former biology student and Noyce Scholar at St. Edward’s, was recently featured in an article on the SEU webpage. In the article, see discusses how she developed a love for science and the impact that the Robert Noyce Scholarship Program directed by Prof. Steven Fletcher has had on her career as a teacher in secondary education. In his two years as Dean of Natural Sciences, Dr. Gary A. Morris has enjoyed meeting with the NSCI Advisory Board each semester. This spring’s meeting marked a special occasion as Dr. Bob Wilems (’63) handed over the reigns as chair of this board to Nick Cristea (’09). The members of the Advisory Board thanked Bob for his many years of service leading the board and look forward to his continued contributions as a member of the board. 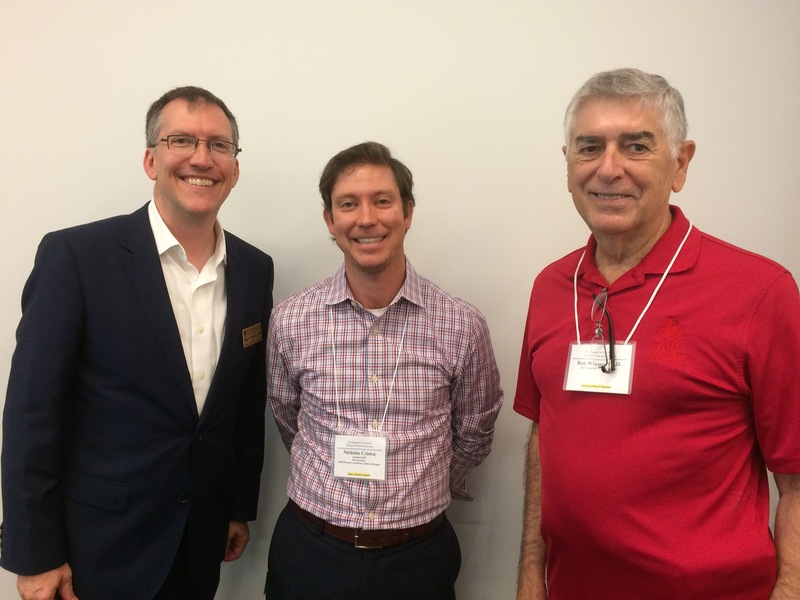 Bob Wilems (right) hands off leadership of the NSCI Advisory Board to Nick Cristea (center), with Dean Gary A. Morris (left). This spring’s agenda featured a visit by CS Prof. Bilal Shebaro and students from his mobile app class, Sophie Gairo, Gage Martin, Marisa Bisaga, and Chloe Becker. They presented their work leading a session at the CCSC conference (held at SEU earlier this month) on mobile app development in which they taught current CS professors how to build mobile apps. The also talked about their experience during the Apple TV hack-a-thon as well as the new opportunities provided by the NSCI seats at the Capital Factory. Next, Munday School of Business Dean Nancy Schreiber and Career Center Director Ray Rogers presented information on our internship matching program with the Austin Tech Council and the developing and deepening relationships between NSCI and MSB students and programs. Dr. Morris gave an overview of 2015 – 2016 accomplishments in NSCI, including faculty publications, student awards, and recent grant awards (including the Steelcase grant). Mr. Michael Lykaios Guerrero presented information on our existing 3+2 engineering partnerships, our partnership with Notre Dame for the ESTEEM program, and our developing partnerships in the health professions. Mr. Michael Morelius and Ms. Kristina Bachman then gave a presentation on 2015 – 2016 accomplishments in Advancement, with special attention to pledges and contributions to NSCI and Wild Basin. The meeting was adjourned for lunch around noon. Many Advisory Board members then attended the annual Senior Seminar presentations. 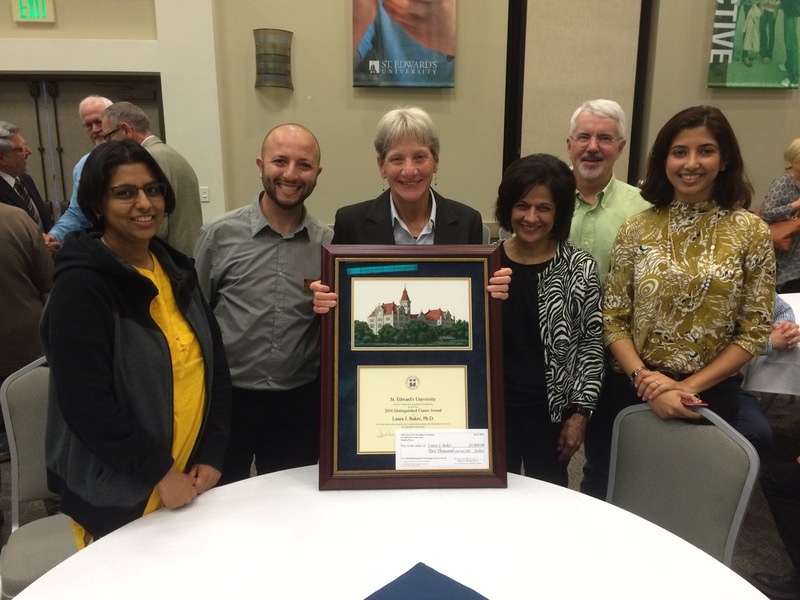 Dr. Baker receives the Distinguished Career Award from SEU surrounded by her CS faculty colleagues. You can follow NASA’s Earth Science Field Missions over the next 6 months on the Earth Expeditions page. NASA has launched a social media campaign with the hashtag #24Seven for people worldwide to upload photos of what they’re doing to celebrate Earth Day and improve our planet. NASA will share “a day in the life” of Earth Science through a series of images on the 24Seven website. What did you do to celebrate Earth Day? Add a comment to this post. Wild Basin is hosting an Earth Day scavenger hunt on April 22, followed by a full moon yoga class on the porch of the visitors center from 7-8pm. For more info, click here. RSVP for the yoga event here. The golden-cheeked warblers have arrived in Central Texas after spending the winter in the tropics. Four males have established territories at Wild Basin, so now is a great time to hike on the trails and listen/look for these endangered songbirds. We submitted grant proposals for continuous water quality monitoring equipment in Bee Creek as well as new signage along the trails to support delivery of dynamic, smartphone-based interpretive content to students and visitors. SEU students in several courses, including Dr. Goering’s Writing About Science, Dr. Bilinski’s Ecology lab, and Dr. Beck’s Intro to Sustainability, are working to create content that will be shared with Wild Basin visitors using the Google Field Trip app and QR codes. Two of the Spring 2016 Wild Basin interns were selected to participate in REUs this summer: Stephanie Perez (Georgetown University – environmental science & policy in Washington, DC) and Amanda De La Rosa (University of Virginia – field-based ecological research at Blandy Farm). Dr. Amy Belaire was invited to be the keynote speaker at the British Ornithologists’ Union 2016 conference. She presented a keynote address titled “The dynamics between people and birds in urban landscapes” at the conference on April 7 in Leicester, England. Several new exhibits have been installed in the Wild Basin visitors center recently, including a set of microscopes, “A Year in the Life of A Golden-cheeked Warbler” exhibit, and touchscreens to explore iNaturalist. Come check them out when you get a chance! Last but not least, the winners of the 2016 Hook Scholarships will be announced this week. Check out the article in Friday’s Austin Statesman. 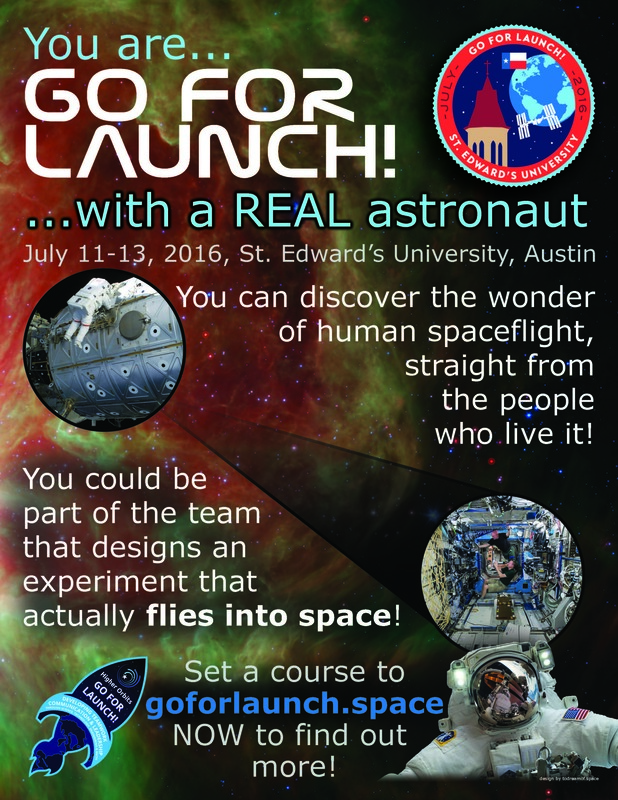 St. Edward’s University is delighted to work with Higher Orbits to host its first Go-for-Launch camp this summer, 11 – 13 July. Teams of high school and college students will learn leadership skills and teamwork. An astronaut will be in residence for the entirety of the camp. With the help of all the mentors, student teams will design an experiment for the International Space Station (ISS). A panel of experts will judge the student proposals, and the winning project will be built, flown to the ISS, and conducted on the ISS. If the launch occurs in the USA, the winning team will receive an invitation to attend (travel costs not included — but seeing a rocket launch is really cool). The cost of the three-day camp is $250, which includes lunch and snacks each day. This is a day camp only (no housing). Note that scholarships will be available, and there is an option on the registration form to register for as little as $10 with a commitment to fundraise with Higher Orbits partners (PopCorn Factory and FannieMae)! For those of you who are NOT students, we are still recruiting mentors for the camp. Contact Dean Morris for more information.